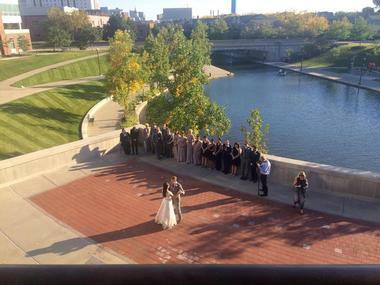 Indianapolis, Indiana has an impressive number of wedding venues for either local or destination weddings. Some are historical and sophisticated like Laurel Hall or the Marvis Arts & Event Center, some are one-of-a-kind like the Scottish Rite Cathedral or Indiana Roof Ballroom, and some are sleek and modern like D’Amore or the Indianapolis Art Center. The Old National Center has been hosting events in the Massachusetts Avenue Arts District in Downtown Indianapolis since 1909, when it was known as the Murat Center. The multi-purpose facility gives couples lots of options to help them chose the most suitable venue. 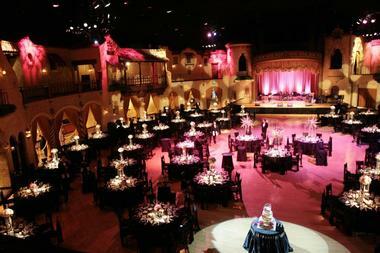 Lavish weddings, for example, are suited to the Egyptian Room, which can accommodate 900 wedding dinner guests. 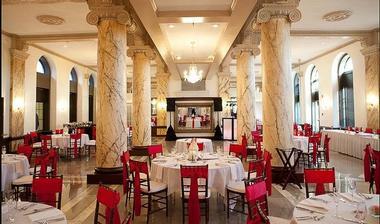 There are seven other venues onsite, including the stunning Grand Lobby that seats 300 guests for a plated dinner. The Old National Center hosts over 300 events per year, so planning ahead and reserving a date is a must. 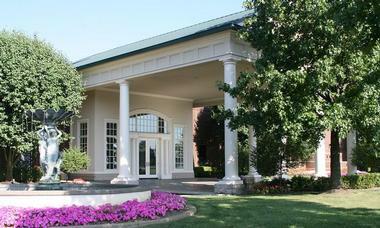 Broadmoor Country Club is a private golf club in the affluent Meridian-Kessler neighborhood. Situated on the world-class Broadmoor golf course, it offers couples five wedding venues, including the Fairway Room, which accommodates 70 guests, and the President’s Room, Donald Ross Room, and Living Room, which each accommodate intimate affairs for 30 guests. 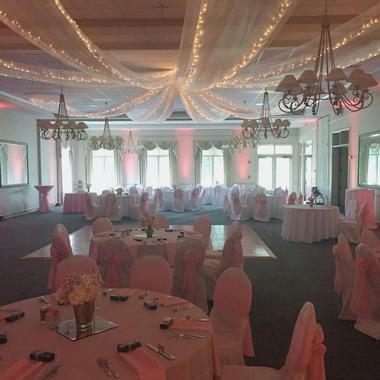 Their signature wedding venue is the Chandelier Ballroom overlooking the golf course. Couples can host their wedding ceremony on the grounds, on the outdoor terrace, or in the ballroom. There is room for 150 guests on the outdoor terrace. Broadmoor Country Club has a full menu of a la carte wedding services and three wedding packages – Silver, Gold, and Platinum. Couples looking for the perfect venue for their rustic-chic or vintage wedding will want to visit CANAL 337, the former Historic Buggs Temple. 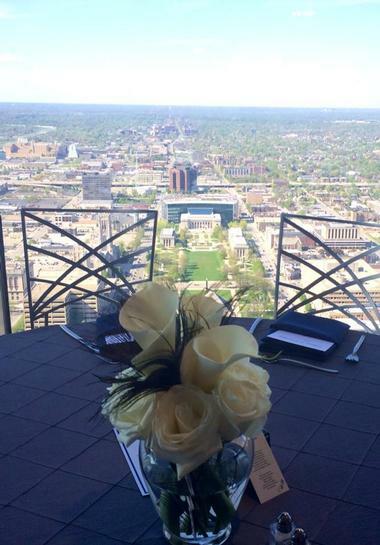 Located along Central Canal downtown, this venue provides beautiful views of the Indianapolis skyline. The two-story venue has bride and groom salons and an outdoor patio downstairs, and the main room, foyer, and outdoor terrace upstairs. The main room features industrial-style cathedral ceilings with wood beams and vintage chandeliers, exposed brick walls, stained-glass windows, and stained concrete flooring. This is a Thomas Caterers of Distinction venue. Couples can even make their getaway by canal gondola. 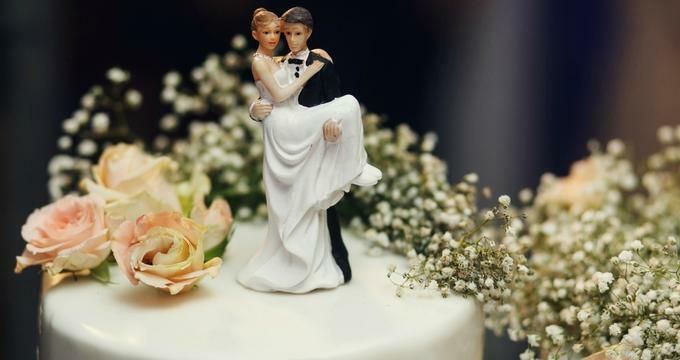 Cheap Wedding Indianapolis is an excellent choice for the budget-conscious couple who wants to host a wedding reception, but at a price point that is affordable. It’s also a good choice for elopements, or those who prefer to spend the wedding budget on the honeymoon. There are several choices from private or family and friends ceremonies under $100 to receptions for up to 30 guests for under $1,000. Couples can even get a marriage license and get married the same day with wedding officiants available 7 days a week and Indy’s Tiny Wedding Chapel mere blocks from the clerk’s office. The Conrad Indianapolis downtown is an elegant Hilton Hotel with art centric amenities and a luxurious spa, perfect for pre-wedding beauty treatments and massages. With 15,000 square feet of refined event space, couples can choose from the signature Vienna Ballroom, which seats up to 360 guests for a plated dinner reception, the seven-story glass enclosed Artsgarden, the more intimate Long-Sharp Gallery, which seats 60, or one of twelve other event spaces at the hotel. 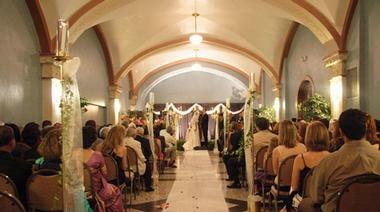 The Vienna Ballroom can also be rented in part for weddings ranging from 50 to 120 guests. Conrad wedding specialists and the culinary team work to create the perfect wedding, from rehearsal dinner to day-after brunch. 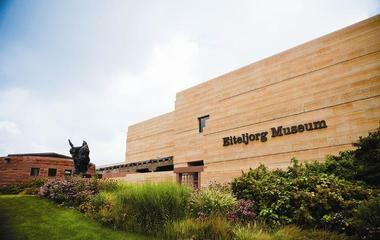 The Eiteljorg Museum provides couples with elegant indoor or outdoor reception or ceremony and reception space. The indoor wedding venue features a dramatic tray ceiling with dark wood beams, natural wood flooring, and white walls. The outdoor café patio offers a view of the canal and is reserved in conjunction with outdoor garden ceremony space. The museum cannot accommodate daytime weddings, and the earliest guests may begin arriving is 6:00pm. Couples can choose from four Tier packages that include spaces and catering. Outdoor spaces are included with Tier 3 and 4 packages. Kahn’s Catering is the exclusive caterer for this venue. Fountain Square Theatre first opened in 1925 as a vaudeville theater with a 40-foot domed ceiling strewn with twinkling stars. The space is fully renovated, retaining many of the original architectural details, particularly on the mezzanine level, and gives the illusion of an outdoor European village. 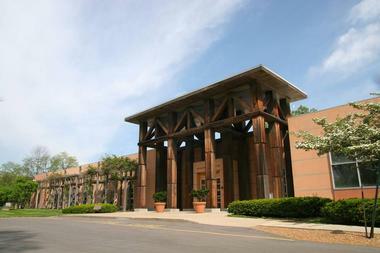 The theater’s main level, which features a large stage, can host 200 wedding ceremony guests. The mezzanine opens for a cocktail hour while the main level is being reset for dinner. Dinner seating accommodates 150 to 350 guests, depending upon whether a dance floor is required. This venue would work well for vintage weddings. Indiana Landmarks Center is the ideal wedding venue for the couple hosting a traditional or vintage-themed wedding. The Grand Hall, built in 1891, is nothing less than awe-inspiring with gilded walls, an ornate domed ceiling and chandelier, and a stage with a stunning pipe organ and Steinway grand piano. Large stained-glass windows and a wraparound balcony provide an exquisite backdrop for wedding photos. Receptions can be held next door in the 1900 Cook Theater. It features a richly intricate wood space from the floor to the soaring ceiling with the original chandelier and a wraparound mezzanine. The Grand Hall seats 450 guests, while the Cook Theater accommodates 350. The Indiana Roof Ballroom is the stuff wedding dreams are made of. Couples hosting an evening wedding will want this venue on their short list. The ballroom’s architecture replicates a European village with a second-floor balcony that encircles the room. The 30-foot-high ceiling is a domed night sky, complete with a moon and twinkling stars that provides the illusion of an outdoor wedding. The 15,700-square-foot oval space includes a bar and cocktail area with an ornate Italian bar; flexible main floor banquet, dance floor, and stage area; promenade, and balcony. Couples can choose from four sumptuous wedding menus. 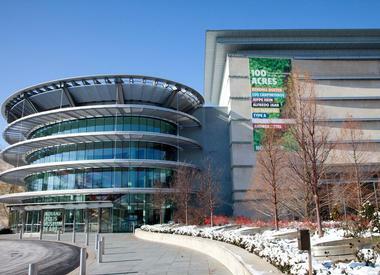 Indiana State Museum can accommodate nearly any couple’s dream wedding from casual to elegant, indoors or out. Their signature indoor/outdoor ceremony and reception venue is the Governor Frank & Judy O’ Bannon Great Hall, which seats 250 wedding dinner guests with room to dance. It’s a contemporary space with soaring ceilings and a glass wall; the Ball Family Terrace is included in the Great Hall rental. 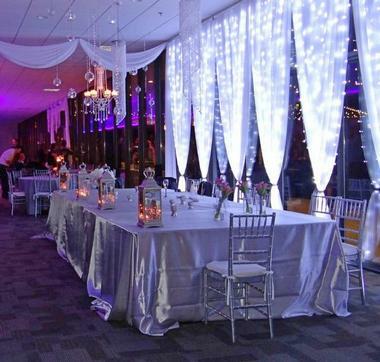 Another reception venue here is Rapp Reception Hall with views of downtown; it holds 80 dinner reception guests. The Farmers Market Café & Terrace is large enough for 100 guests, and the L.S. 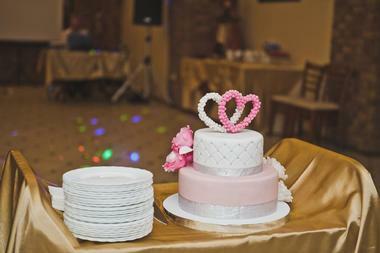 Ayres Tea Room can host an intimate reception of up to 30 guests with room for dancing. The Indianapolis Art Center is located along the White River in north Broad Ripple Village. The contemporary space was designed by renowned Indianapolis architect Michael Graves. 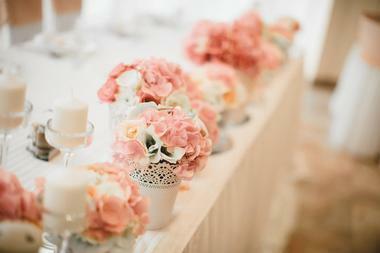 This venue is both elegant and affordable, a winning combination. Brides and grooms renting here are assured that their event is the only one at the center on that day. 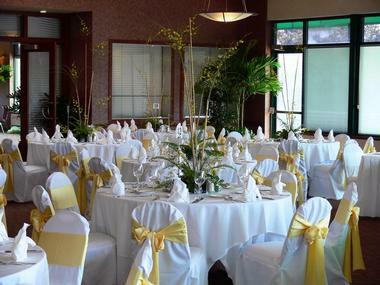 Receptions and ceremonies are both flat fees that are all-inclusive. Tables and chairs, audio-visual equipment, pre-event consultation, day-of coordination, set-up and tear-down, and security are all included. There are eleven gorgeous indoor and outdoor event spaces to choose from, depending on the wedding size. The Art Center also provides a list of preferred vendors. 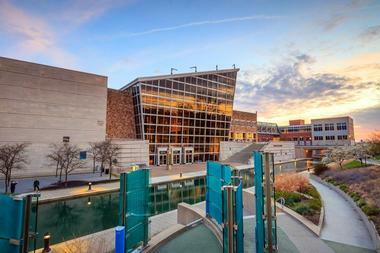 Indianapolis Museum of Art offers couples five wedding venues for the big day. The Deer Zink Events Pavilion offers enchanting views of Sutphin Fountain and gardens through its two, two-story walls of windows. It also features a neutral décor and a dazzling oval skylight. With the dance floor, couples can host up to 300 dinner guests here. The symmetrical Formal Garden has a central fountain, trellised entrance, and privacy hedge. Sutphin Fountain Room holds 80 guests, while the contemporary room overlooks the fountain from a wall of floor-to-ceiling windows. The Garden Terrace can hold up to 60 guests, more for receptions on the lawn. The Pulliam Family Great Hall accommodates 120 seated dinner guests in a contemporary space. Laurel Hall, built in 1916, is the former home of one of Indiana’s most notable families. The Jacobean Revival architectural style features a distinctive grand staircase, rich wood paneled walls and decorative high ceilings, wood floors, one-of-a-kind oriental rugs, carved limestone fireplaces, expansive windows, and many other opulent design details throughout. The manor, with lovely terraces and outdoor fountains, is set on 6 acres of lush gardens and green space, giving couples lots of options for their private ceremony. There is also a third-floor chapel for couples yearning for that small-town feel. This venue provides flexible indoor/outdoor space for weddings of up to 200 guests. Maple Creek Golf and Country Club is one of the top three courses in Indianapolis, designed by Golf Hall of Famer, Pete Dye. The beautiful course has its namesake maple trees scattered throughout, making for eye-pleasing views from the country club event space. The country club can accommodate intimate weddings with just a few guests to lavish affairs of up to 250 guests. Executive Chef Todd Harmon works with couples to create the perfect hors d’oeuvres for pre-dinner cocktail hour and will also accommodate special dietary requests for the dinner menu. Maple Creek can arrange for audio visual equipment, special rentals, staging, and other needs. Built in 1883, the historic Mavris Arts & Event Center is a unique four-story, industrial chic, repurposed warehouse that has been fully renovated and modernized. The original hardwood floors, exposed brick walls, ceiling beams, and other architectural details have been preserved to create a timeless ambiance. Couples can rent the 3,000-square-foot speakeasy on the lower level with wood beams and posts and stamped concrete flooring for an intimate wedding reception or rehearsal dinner. The other option is renting the main space, which includes the first, second, and third floors, plus the rooftop patio and the ground-level English garden. The “Man Cave” for the groom’s party and the Bridal Suite for the bride’s party are also superb spaces. When a tiny wedding guest gasps and says, “This must be where all the princesses live,” it’s sure to be a magically romantic place. The city’s only rooftop garden venue, Regions Tower provides an 11,000-square-foot terrace in the midst of the cityscape. An adjoining 12,000-square-foot indoor wedding event space also offers panoramic views of downtown Indianapolis with wall-to-wall windows. 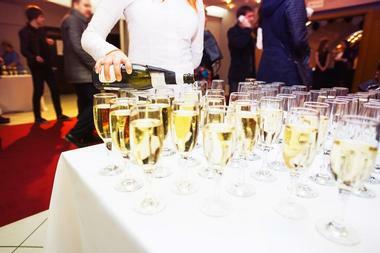 The exclusive caterer at Regions Tower is JPS Events, formerly Oasis Events. 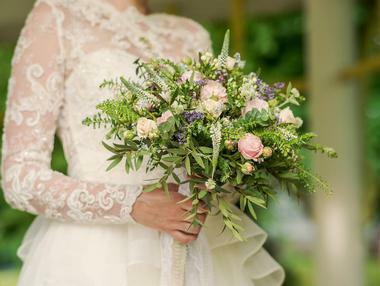 They have a number of wedding packages on offer: décor, linen, bar, food (with three tastings), plus three personal design strategy sessions, day-of coordinator, and week-of concierge. They can also provide a preferred vendor list. Pipers at the Marott and Pipers Premier Catering is a modern wedding event space in south Indianapolis. The décor features carpet and a rich mahogany dance floor, mahogany sconce pillars and chair rail, and elegant tray ceilings with recessed lighting and chandeliers. 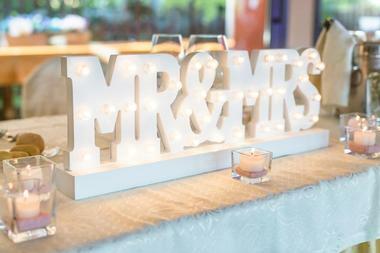 Couples can personalize this wedding reception space with an array of in-house rental décor. This is a Pipers Catering venue, so the bride and groom to-be can attend a tasting, make their selections, and then relax on their big day. The Grand Manor can accommodate up to 225 guests for a seated wedding dinner, or 200 guests with a dance floor. Ritz Charles is an all-in-one venue with both wedding chapel and indoor and garden reception venues on the same property. The stark white modern chapel features clean lines, a vaulted ceiling, rich oak flooring, vintage chandeliers, and white Chiavari chairs. There is a lovely bride’s dressing room, and a groom’s retreat for pre-wedding preparations. Couples can choose the recently renovated Ritz Charles ballroom with neutral décor, carpet, and a wood dance floor that can accommodate nearly any size wedding with 15,000 square feet of continuous space. The other choice is the Garden Pavilion, a glass structure that offers 360-degree views of the surrounding woods, gardens, and imported fountains. It seats 250 guests with a dance floor. Sahm’s Atrium at the Tower is in the heart of downtown Indianapolis. This stunning courtyard-level venue offers happy couples an indoor/outdoor wedding space for the big day. The ultra-modern atrium features a soaring wood ceiling and a full floor-to-ceiling window wall, carpeted flooring, stone pillars, and sconce lighting. The space is flooded with light for daytime weddings, and at night it morphs into a romantic space with subdued lighting and, hopefully, a clear starry night. Sahm’s Atrium offers three wedding packages that are all-inclusive, and affordable. 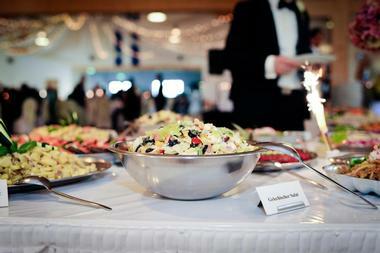 Wedding dinners are buffet-style or can be upgraded to plated dinners. 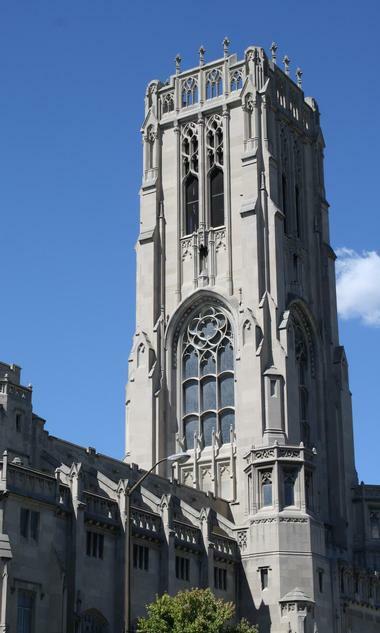 The magnificent neo-Gothic Scottish Rite Cathedral is listed on the National Register of Historic Places. Its historic architecture is characterized by a 212-foot-high tower with a 54-bell carillon, and the interior of the Cathedral must be seen to be believed – it’s that stunning. Four wedding venues include the opulent ballroom and mezzanine, which seats up to 350 guests for a dinner reception, and the South Lounge finished in rich dark woods and gorgeous stained-glass windows, which seats 200 guests. For larger affairs, couples can go with either the luxurious Grand Hall and mezzanine seating 500 guests, or the lavish ceremony theater seating 1,100 guests. The Tiler’s Room is perfect for elegant weddings of 50 or fewer guests. The award-winning clubhouse at The Hawthorns Golf and Country Club is a great choice for a classic, traditional, or modern wedding. The ballroom has a capacity for 300 seated wedding banquet guests, and 500 for cocktail-style receptions. Light and airy, it has numerous windows and French doors, plus an attached private patio. The Blue Heron is the back parlor of the ballroom with French doors and the patio, while the King Fisher is the front parlor of the ballroom with large windows and skylights. Both halves accommodate 130 to 175 seated guests. The catering staff is committed to honoring culture and faith in creating the wedding menus. Historic Schnull-Rauch House, also referred to as The Manor, is owned by the Children’s Museum of Indianapolis and sits adjacent to it. House and Gardens Show featured the grandeur of The Manor in its television series, and it’s since been made available for event rentals. The 1904 home showcases a grand ballroom, romantic stained-glass windows, exquisite fireplace mantles, hand-carved woodwork, and inlaid hardwood flooring. 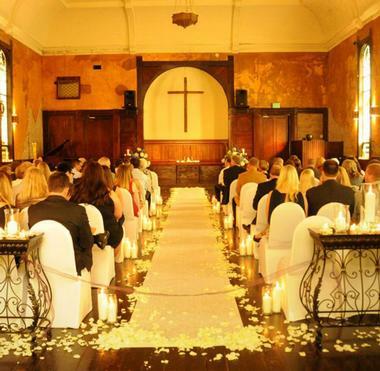 This ceremony and reception venue can accommodate 100 guests or more. The exclusive caterer for The Manor is Sodexo, whose chef can customize your wedding menu, taking dietary restrictions into account. 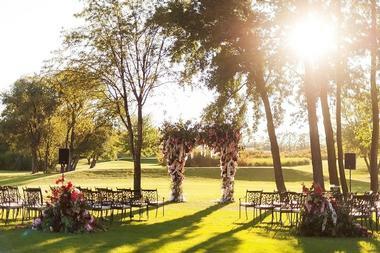 The panoramic lake views of The Montage offer couples the perfect venue for wedding ceremonies and receptions. The Cabernet Room/Patio features expansive views of the lake and surrounding trees; the contemporary space seats 360 dinner guests with room for a dance floor. The attached patio offers extraordinary views of the tree-lined lake. 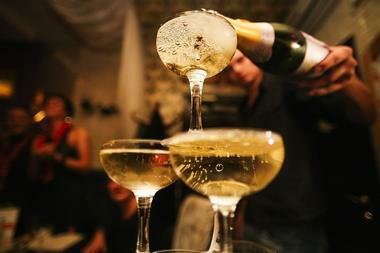 The Champagne Room and adjoining patio can seat 80 dinner guests. The ultra-modern all-glass enclosed Chardonnay Room can also accommodate 80 guests. 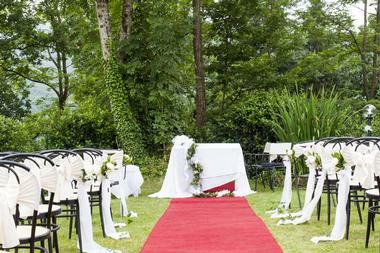 The Ceremony Garden is a secluded outdoor lakeside ceremony venue with indoor backup spaces. 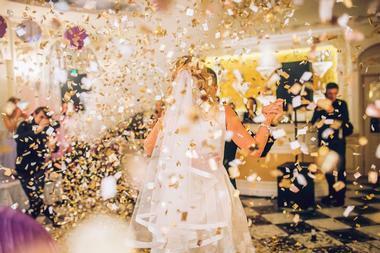 The Montage is a Kahn’s Catering venue, offering eight wedding packages to meet every couple’s needs. Inside this 1875 church, the bride and groom to-be will find everything they need. Traditional and ornate on the outside, The interior of The Sanctuary on Penn has an ancient Roman ruin design. Dark wood floors and architectural details, intricate stained-glass windows, distressed walls, and antique lighting set the ambiance. The Sanctuary offers a nearly endless list of services, from photography to a trial run for the bride’s hairdo to an addressing and mailing service. Their list of complimentary products and services is nearly as long, including a full-service wedding planner. If its personalization a couple is looking for, then The Sanctuary on Penn should be on the short list.